The next-gen Toyota Camry Hybrid is India-bound in 2019 and promises to be a real improvement over its predecessor. We drive the JTP versions of the Tata Tiago hatchback and Tigor compact sedan to find out if these are the affordable performance cars India has been waiting for. It’s bigger and feels more upmarket on the inside, but is the second-gen Maruti Suzuki Ertiga good enough to defend its territory? We find out. The car that started Hyundai India’s innings is back completely revamped. Can the new Santro rekindle the magic of the beloved original? Mercedes-AMG’s iconic SUV, the G 63, in a whole new avatar. But does it still retain its phenomenal desirability quotient? It’s an auto-rickshaw… it’s a car… no, it’s India’s first quadricycle. We get behind the wheel of the controversial Bajaj Qute that is finally set to go on sale. The new BMW X5 is bigger, bolder and far better equipped, too. We take it for a spin to see just how much of a step-up it is. The refreshed Ford Aspire comes with a new petrol-manual combo and a killer price tag. But in the company of the Maruti Suzuki Dzire and the Honda Amaze, is it the best in the segment? We find out. How much does your car really cost to fix? Every little detail you’d want about spare parts for different types of cars on sale in India is present in our exhaustive spare parts survey. Buy (Order online) Auto Car Monthly Magazine (Magasin) Now. 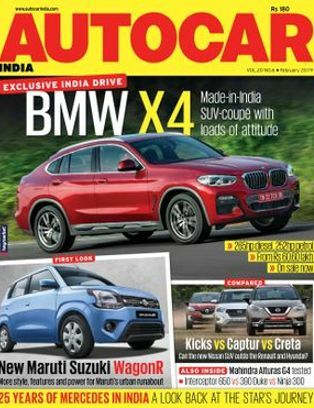 Auto Car Monthly Magazine February, 2019 Issue: Half four-door coupe, half-SUV – the BMW X4 aims to follow in the footsteps of its successful bigger sibling, the X6. Just how good is it? We bring you an exclusive India review. In every department, the new-gen Maruti Suzuki Wagon R has grown up – be it in terms of size, features or engines. We take a close look. Is the Nissan Kicks good enough to beat the reigning midsize SUV champion, the Hyundai Creta? Throw the Renault Captur into the picture, and things become real interesting… We put the Mahindra Alturas G4 through our comprehensive road test, to see just how well it fares in real-world conditions. We wind back the clock as Mercedes-Benz completes 25 years in India. It’s more than just a tougher-looking Bonneville – the Triumph Scrambler 1200 is a thrill-a-minute bike. Also part of this issue are a drive of the Jaguar F-Pace 25t petrol and a face-off between the Royal Enfield Interceptor 650, KTM 390 Duke and the Kawasaki Ninja 300! The exciting world of cars, brought alive in Auto car India’s engaging stories and features, has made it a ‘must-read’ magazine for anyone interested in cars. Autocar India’s exhaustive and authoritative road tests, true to the heritage of its parent title, are the best in the business. Over the years, Autocar India has grown from being just a car magazine to a comprehensive ‘car expert’ brand. 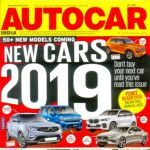 Autocar India is, by far, India’s best-selling car magazine with a readership that is more than double its nearest rival. But it’s not numbers alone that make Autocar India the country’s best car magazine. 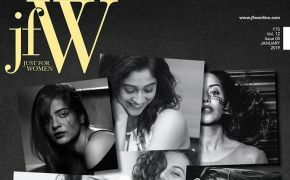 Since its first issue back in September 1999, it has regularly been the first with the news and has earned an enviable reputation for breaking stories before any other media. Auto Car Monthly Magazine prices are inclusive of shipping and handling through USPS. (for US deliveries). For other Countries shipping will be handled through their Postal Services (like Airmail in India). Address for delivery (Subscription) can be changed anytime. Please mail us the changed address details to info@magazinesemporium.com. Auto Car Monthly Magazine subscriptions will commence either from current issue or from next coming issue. Auto Car Monthly Magazine English Magazine will be shipped immediately on getting the issues from the publisher. They are inclusive of Diwali and Annual issues. Any special issues will also be sent free.